The use of butter surpasses the boundaries of the kitchen. From mango butter to kokum butter to shea butter, etc., organic butter products can provide tremendous benefits for your hair and skin. For example, it can protect your skin’s natural oils, moisturize your hair, and more. Do you count yourself as a butter connoisseur? Well, sometimes even the best need a quick reference from time to time. What Does Mango Butter Do For Hair? What Are Cocoa Butter Substitutes? Is Kokum Butter Good For Lips? Is Kokum Butter Good For Hair? Is Cocoa Butter Good For Hair? Is Cocoa Butter Good For Eczema? Does Mango Butter Lighten Skin? Does Mango Butter Get Grainy? Does Cocoa Butter Have Vitamin E? Can Shea Butter Become Moldy? 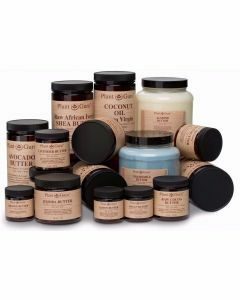 Can Shea Butter Be Used On The Face? Can Shea Butter Be Used As A Moisturizer? Can Shea Butter Be Melted? 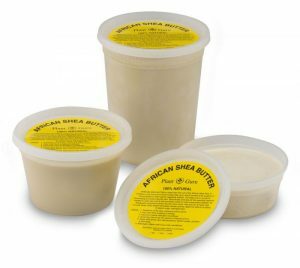 Can Shea Butter Be Frozen? Can Cocoa Butter Remove Dark Circles? Can Cocoa Butter Be Used For Tanning? Are Cocoa Butter And Shea Butter The Same? Where Does Mango Butter Come From? What Happens If You Ingest Any Of Our Butter Products? What Does Kokum Butter Do? What Can Mango Butter Be Used For? What Are The Main Differences Between Cocoa Butter, Mango Butter, Kokum Butter and Shea Butter? Has Cocoa Butter Got Caffeine In It? Does Shea Butter Lighten or Darken The Skin? Does Shea Butter Grow My Hair? Does Mango Butter Have Natural SPF? Does Mango Butter Clog Pores? Does Kokum Butter Have SPF? Does Cocoa Butter Help Stretch Marks? Can You Eat Mango Butter? Can You Eat Kokum Butter? Can Shea Butter Be Used On Hair? Can Shea Butter Go Bad? Can Shea Butter Be Eaten? Can Mango Butter Go Bad? Can Mango Butter Be Used On The Face? Can I Use Mango Butter On My Skin? Can Cocoa Butter Help Acne? Can Cocoa Butter Clear Acne Scars? Can Cocoa Butter Be Used As A Moisturizer? Mango butter nourishes the hair and the scalp. It works by penetrating and nourishing the hair follicles. Packed with vitamins and amino acids, it softens the hair and makes it healthier. More specifically, it treats excessively oily and dry hair and scalp. The first of these is that it’s a moisturizer and emollient, due to the high concentration of fatty acids. This has the effect of keeping the scalp and hair moisturized for a long time. In addition to that, it also speeds up the rate at which cells multiply and mature, thus making your hair grow faster. If you have short hair and have always wanted a way to make it grow longer, this is a product that you should definitely try out. Mango butter also has a range of vitamins including Vitamin A, C, E, D and B. It also contains folic acid and trace minerals such as magnesium, calcium and folic acid. Vitamin A, C and E are beneficial to the growth of long, healthy and strong hair. With time, they will make your hair more thick and shiny, and reduce the rate of breakage or split ends. Mango butter also intrinsically has anti-UV properties. When applied to hair, the hair will be protected from damage by the sun, which is a major contributor to problems such as dry, thin skin that is prone to breakage. Cocoa butter is a source of fat for chocolate thus providing texture, sheen, and snap to the product. Cocoa butter substitutes include palm oil, shea butter, and kokum butter among others. Substitutes are chosen because of the expensive price that comes with purchasing cocoa butter. One of the substitutes you can use for cocoa butter is palm oil. This has some of the qualities of real cocoa butter, including the ease with which it moisturizes the skin. It can also be used to soften hair as well. Palm oil is well known to alleviate very dry skin, which usually leads to itching and eventual introduction of bacteria into the skin which will lead to an infection known as cellulitis. The other substitute you can use is coconut oil. This has been used as a lotion for centuries in many parts of the world, particularly in the warm coastal regions. The fact that the oil is cheap and easy to find means that it is accessible to many people who might not access cocoa butter for whatever reason. In summary, there are a variety of products that you can use as cocoa substitutes, though some of them might not have the exact effects as cocoa butter. The key thing is to ensure that you buy a high quality substitute from a store that has a good reputation. Kokum butter is derived from fatty acids but is non-greasy. It has a soft yet dense texture that can easily be absorbed by the skin once applied. An added benefit of Kokum butter is the presence of specific compounds that have antibacterial properties. When choosing a skin product that you can use on your face and other parts of the body, you should be careful to get the ones that are non-comedogenic. The latter doesn’t block the pores, which means that any sebum produced by the skin will not have a way out to spill over onto the skin. As a result, the sebum builds up and causes formation of pimples and acne. The other issue you might have is whether the product is greasy or not. Having a cream on your face should not make it shiny and greasy, as this look is not attractive. Fortunately, this is a problem that you are not likely to face if you use kokum butter. This butter is not greasy because it has a light consistency, and is quickly absorbed into the skin. This means that you will end up with skin that looks well hydrated and not shiny at all. Always make sure that you buy your kokum butter from a vendor who values quality. There are some who may add additives to the butter and then claim that it is 100% natural. Simply doing research about trustworthy stores and brands will help you avoid wasting money on these inferior products. Kokum butter is good for use on the lips. It can make lips feel soft and smooth without the greasy feel provided by balms filled with wax. It is filled with beneficial compounds that promise to regenerate skin cells too. It can also heal fissures of the lips. If you have a stock of natural kokum butter, you can also use it for your lips as well. The lips are a unique part of the body since they have the thinnest skin in the body. This means that they are susceptible to issues such as drying out. It’s also easy for them to become damaged, such as when you try to peel off dry skin and end up having a wound in the site you were peeling it. Using kokum butter for your lips is a great idea to avoid it. The butter has moisturizing properties, so it will ensure that the skin on your lips stays hydrated. In addition to that, the kokum butter forms a physical barrier between your lips and the elements from the outside world. It makes it more difficult for external factors to damage your lips. If you are interested in having healthy-looking and attractive lips, try using organic kokum butter from today. As always, you should ensure that you buy the product from a quality vendor since they are most likely to have genuine organic products. Kokum butter is found in cosmetics, toiletries, soaps, creams and body butters, and skin healing lotions. It is used as a scalp treatment because it can promote strong roots and provide nourishment to the hair. It has a light fragrance that is not as noticeable as other strong-smelling butters. One of the products you might come across is kokum butter. This is extracted from the fruits of the kokum tree which is indigenous to India. Though it’s mostly used as a facial moisturizer, it also has excellent benefits when it comes to hair. Because kokum butter retains moisture in hair well, it keeps your hair well hydrated throughout the day. The benefits of these include the fact that your hair will be shinier, healthier, stronger and easier to comb or manage in other ways. It can also reverse the effect of hair loss particularly if the loss is due to issues such as dryness of the hair. Since kokum butter is a natural product, you also don’t need to worry about dangerous chemicals doing damage to your hair. Kokum butter is good for hair and can be used by everyone. Whether you have an issue with the health of your hair or are satisfied with it, trying out kokum butter will definitely be well worth it. The only thing you should be cautious about is ensuring that you buy the correct product which is 100% organic. Cocoa butter is good for hair growth since it can keep the hair smooth and healthier in the process. Like coconut oil, cocoa butter has softening and healing properties that will make the look shinier as it grows. Its fragrantly sweet smell keeps the hair smelling good at all times. However, nothing can be further from the truth. If you have natural cocoa butter, you can do more than just applying it on your skin. One way to do this is to use it to treat your hair. The fact that cocoa butter is extremely moisturizing means that it will keep your skin soft and supple, and will make it look much healthier as well. Of course, this depends on the proper application of the cocoa butter, particularly if you are using it when you have long hair. In addition to keeping the skin hydrated, cocoa butter also makes the skin strong. One of the commonest causes of hair loss in both men and women is having brittle hair. This can be due to many factors including using the wrong hair care product which strips the hair of all its moisture. By using cocoa butter on your hair, you will be reducing the rate at which this breakage occurs. The other benefit of cocoa butter when it comes to hair is the fact that it makes it more manageable. The soft strands of hair will be much easier to handle, whether you are plaiting it or simply combing it. This saves you a lot of time. If you want to keep your hair healthy and attractive, try using cocoa butter and chances are that you will not be disappointed. Cocoa soothes the skin from rashes, burns, and infections. As such, it is used as a natural treatment for eczema or dermatitis. It helps prevent drying, peeling, and itching which are common to individuals suffering from eczema. It can be combined with tea tree oil and aloe vera gel too in preventing rashes. There are many natural products that are billed as being effective at treating eczema. One that has been consistent in doing this is natural cocoa butter. Natural, raw cocoa butter has no additives, which means that it will not damage your skin further. In addition to that, it also has a range of minerals and vitamins whose role is to create a barrier on the skin. This prevents damage to the skin from the elements, such as sand that may clog pores. In addition to that, the protective layer also protects the skin from any external allergens that might induce eczema or make it worse. 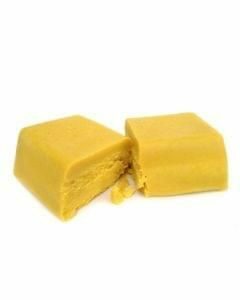 A vitamin of note that is found in natural cocoa butter is vitamin E. This vitamin has strong anti-oxidant properties which are ideal for treating eczema. When the immune system attacks the skin when you have eczema, many oxidants are released, and these will lead to tissue damage which is manifested as the scaling and blotching. Vitamin E is an anti-oxidant, so it neutralizes the oxidants and keeps eczema at bay. Shea butter is known for having a smoky, nutty scent but it does not smell. 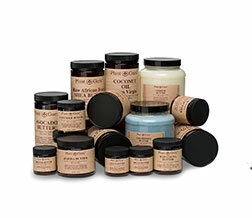 Anyone who is familiar with Shea butter will recognize its natural scent. It does not linger even when applied to hair or skin and used for its particular purposes. One of the questions you might have when you intend to use Shea butter is whether it has a scent that might irritate you or the people around you. Cosmetics that are very pungent tend to be disliked by many people. There are many reasons for this, including personal preference and medical reasons. For instance, some people might end up having an allergic reaction to the scent. If you want to use Shea butter for the first time, this is not an issue you should be worried about. The product definitely doesn’t have a bad smell, even if you have kept it for a long time without using it. Shea butter has a scent that can be described as nutty with a hint of vanilla. It’s not overpowering, and someone would need to be close to you in order to smell it. In addition to that, the vast majority of people find this scent appealing. If you are really interested in reducing the scent of the Shea butter, you can also opt to buy refined Shea butter rather than the raw type. The refined version is usually treated using a variety of means including deodorization as well as filtration through clay to give it a very faint scent. Mango butter works by lightening age spots, stretch marks and sun damage spots. Since it contains natural Sun Protection Factor or SPF, it can also protect the skin from sun damage and provide the much needed protection that it needs against harmful radicals. When using natural products such as mango butter, people tend to have different reasons why they are trying them out. One of the commonest is to lighten one’s skin. There are many synthetic products out there claiming to be able to lighten skin, but the problem is that most of them contain dangerous chemicals that may do you harm in the long term. Mango butter can lighten your skin to some degree. This is as a result of the fact that it hydrates the skin and keeps it soft and supple. More importantly, it has anti-UV properties which tighten skin, heal eczema and get rid of dark spots that come about due to age and sun damage. With regular use, this will result in well-toned skin which is also lighter than usual. A property unique to mango butter is the fact that it works deep into the skin to exert its effects. In addition to making the skin healthy and getting rid of dark spots, this also has the effect of healing muscle tension as well as aches. 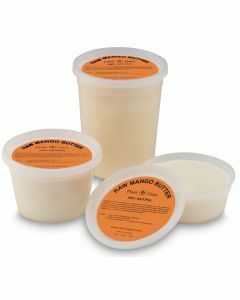 Mango butter does not get grainy provided that it does not undergo any temperature increase during storage or does not cool down slowly in the manufacturing process. It can become grainy when heated over 70 but not as much as other butter does. The cause of graininess in mango butter is temperature fluctuations or exposing the butter to extreme temperatures. For instance, if you live in the tropics and keep the mango butter in the glove compartment of your car during the day, the excessive heat may result in graininess, particularly if this is repeated many times over. This can also happen if a shipment of mango butter is delayed at the port of entry when the products are imported during the summer. This means that when you have mango butter, it would be a good idea for you to store it properly. Many manufacturers of organic mango butter give instructions on the best way for storage of the mango butter, and it would be ideal for you to follow such instructions. However, there are some basic things you can do to reduce this. These include storing the mango butter container in a cool and dry environment that has no extreme temperature fluctuations. When all is said and done, however, mango butter is an excellent beauty product and is easy to take care of. You don’t need to go out of your way to avoid the graininess, and you will be glad that you got it in the first place. Kokum butter is recognized for its fair and nutty smell. When compared to cocoa butter and other vegetable butters, it has much less odor. Many vouches for how great the smell is when applied to the skin even when it has lingered on the skin for a long time. The allure of kokum butter is the fact that it can be used by all skin types. Whether you have oily, dry or normal skin, you can use it without the fear that you will end up damaging your skin for good. However, one factor that may be bugging you is whether it has a bad scent or not. There are many natural cosmetics which have a scent that many people will not tolerate, which means that its use is limited. Fortunately, this is not the case with kokum butter. This butter has a nutty, earthy smell that is very mild. Even when in its pure form, kokum butter has a mild scent. In order to smell it, people will need to get very close to you, which means that you will not be affecting the people around you with the scent. That said, however, the scent of kokum butter is actually very nice, and you are likely to appreciate it. In summary, kokum butter is an excellent product that you should definitely try out whether you have skin problems or not but want to keep your skin healthy. It can be used in place of other products such as coconut oil or cocoa butter. Cocoa butter contains compounds and vitamins that are good for skin health, vitamin E included. Together with Vitamin K, and Phytosterols, Vitamin E makes cocoa butter a good source for skin hydration. Vitamin E also works to repair blemished skin, deeply cleanse pores, and provide soothing relief to the skin. Natural cocoa butter has many ingredients in it, one of which is vitamin E. Vitamin E is an antioxidant, and is billed as the strongest antioxidant vitamin. This is important because many of the skin conditions that people suffer from arise from oxidation of the skin tissue and cells. This results in rapid cell death, formation of wrinkles, scarring and even putting you at risk of getting skin cancer. By using cocoa butter on a regular basis, you will also be benefitting from the vitamin E within it. Your skin will age more slowly, and you are also likely to notice a reduction in some of the defects on your face if you have any. These include light scars and moderate wrinkles and lines. The good thing is that you can use natural cocoa butter without any additives, and still get the same effect. This is because the vitamin E naturally occurs in the butter. However, there are some companies that manufacture beauty products using cocoa butter, and add other vitamins that might help in keeping the skin healthy. All in all, cocoa butter does have vitamin E, and it plays a major role in ensuring that the beauty product works. Cocoa butter is a semi-solid to solid oil that is essential in moisturizing skin and relieving it from dryness. This makes the butter comedogenic for any skin type. This is why cocoa butter is best used for nourishing other parts of the body. One of the concerns that many people have is whether the cocoa butter blocks pores or not. This is a problem that many people with oily skin have to contend with. However, it is not limited to them; having blocked pores is a bad thing even if you have normal or dry skin. By clogging the pores, sebum and other materials cannot be extruded to the surface of the skin, so they accumulate under the skin and cause breakouts. Cocoa butter does not clog pores, but there are several caveats to this. For one, it’s advisable to clean your face thoroughly before applying the cocoa butter. The aim is to remove any surface debris that might impede entry of the cocoa butter into the skin in order to make it more effective. It also removes dirt from pores. More importantly, always use cocoa butter made with the highest standards in mind. These products tend to not be comedogenic, so you can rest assured that you can use them in the long term without the fear of developing pimples and acne. Yes, Shea butter becomes moldy and molds in this type of butter is generally white. This is very hard to spot especially when the Shea butter is rather white than creamy in color. Buying a new jar of Shea butter will be required once mold has been spotted instead of just scraping the mold off from the mixture. The simple answer to the question is that yes, Shea butter can become moldy. However, there are factors that will predispose it to being so, and it’s important for you to consider them if you want your Shea butter to last longer. For mold to grow in any organic product, it needs moisture and warmth. Removing either of these from the equation means that your Shea butter is likely to stay fresh much longer, and it will also retain its effectiveness. Typically, people use Shea butter after either showering or washing their face. This means that when you take the Shea butter, you may end up depositing water droplets in the container. When the water stays there for long, it ends up encouraging mold growth. Reducing this effect is as simple as using the Shea butter with dry hands, and also making sure that the container with the butter is stored in a cool and dry environment. This way, the spoilage will be delayed, and you can continue to enjoy the Shea butter for much longer. You can also read instructions on proper use and storage of the butter from the manufacturer for further advice on how to do this. Shea butter is noted to help hydrate most of the skin. As such, it is used in body moisturizing creams. Some people use it on the face as a moisturizer too but others with more sensitive skin do not use Shea butter on their faces. The other benefit of using Shea butter on the face is the fact that it has several vitamins including vitamin A. the latter is known to have many healing properties. For this reason, it is effective in treating eczema, dermatitis, wrinkles and even blemishes. These skin defects are most commonly found on the face. If you are interested in using Shea butter for the above benefits, there are a number of issues you need to keep in mind. These include using moisturizers that contain Shea butter. These should be of high quality for you to be assured of the results. If you intend to use Shea butter in its pure state, you should take the precaution of using only small quantities. When shopping for a cream that contains Shea butter as one of the common ingredients, make sure that it’s meant for use on the face. This way, it will have no comedogenic properties so you are unlikely to end up having acne or pimples. In summary, Shea butter or products containing Shea butter can be used on the face. The key thing to remember is to use quality products and to ensure that you only use a very small quantity if you instead decide to use the pure form of the butter. Yes, Shea butter can be used as a moisturizer. Thanks to its peculiar properties, it does more than moisturize. Shea butter is known to deliver key anti-aging and anti-inflammatory components right into the skin. That’s why it is often used to protect the skin’s natural oils and remedy dry skin. Natural products such as Shea butter have the benefit of locking in moisture to the skin, thus keeping it hydrated all day long. Shea butter is well known for its moisturizing effects, and this is why it’s used to manufacture many cosmetic products. While providing the moisturizing effects, Shea butter does not leave your skin looking shiny as other products do. You can put it on in the morning and be confident that you will be looking beautiful throughout the day. Since Shea butter is a natural product, it can be used by people who have all sorts of skin types. For instance, people with oily skin tend to avoid moisturizers, thinking that they will block their pores and lead to the formation of pimples. However, the truth is that even oily skin needs to be kept hydrated even if it produces a lot of oil. Using Shea butter on this type of skin ensures that the pores will not be blocked since it’s not a comedogenic product. This information has been researched and verified, so you can be sure that it’s a fact. In summary, Shea butter can be used as a moisturizer, and it will do a very good job at this. This is as long as you use a high quality product from a reputable vendor. Shea butter can be melted. However, you should place it in a ziplock bag to prevent it from coming into direct contact with water. After placing the butter in a bag, carefully pour hot water into a pot and place the bag on top. Let it sit for a few minutes. The shea butter will begin to melt inside the bag. The typical approach to solving this problem is melting the Shea butter and then applying it to your hair or other parts of your body. Fortunately, this is not a complicated process. However, there is a risk that you will overdo it, ending up with a product that is almost burnt and therefore unusable. As long as you are careful, you will likely get the results you expected. You can melt Shea butter at home. To do this, you need a hot water bath at a temperature between 140 degrees and 160 degrees Fahrenheit. You can then place the Shea butter in a Ziploc bag, and then place it in the water bath. The goal is to prevent water from seeping into the bag. With time, the Shea butter will start melting, but you should maintain the temperature of the water as stated so that the process is fast. Once boiled, you can then remove it from the hot water bath and add fragrances if you wish to. Shea butter can be frozen. In many cases, this is done after mixing the butter with other ingredients. If you want to firm the products you have just made, you should not immediately place it in a freezer. Make sure you transfer your butters into cool containers and use the refrigerator. Once the shea butter turns back into a smooth fat again, you can freeze it without harming it. If you happen to have 100% Shea butter for your cosmetic use, chances are that you will be looking for ways to make sure that it lasts as long as possible. Simple things such as making sure that the container the butter is in is correctly closed once you are done using it. You should also make it a habit to prevent water from contaminating the Shea butter since this might lead to the growth of mold. Using high quality Shea butter also helps. A large number of people consider freezing as a way of keeping the Shea butter from becoming rancid. This is an easy process; you only need to place the Shea butter in a container and then put it in the freezer. You should make efforts to ensure that any thawing ice does not enter the cream, thus contaminating it. In summary, it is true that you can use freezing as a method of keeping Shea butter fresh. However, you should also remember that other things such as sealing the container properly and making sure that the product you buy is of high quality also help, and you should insist on this. Yes, cocoa butter has a moisturizing effect that effectively fades and treats dark circles under the individual’s eye. It also contains anti-inflammatory agents that help tackle dark circles from the inside out. If you develop dark circles from lack of sleep or stress, cocoa butter is your friend. Using cocoa butter on your face on a regular basis is an excellent way to get rid of the bags under your eyes. This is because the cocoa butter has several effects on your physiology, so you end up gradually getting rid of the dark circles. The first of these properties is that cocoa butter acts as a natural anti-oxidant from the cacao bean. This helps indirectly in reducing dark circles by treating underlying conditions that might affect your skin. Examples of these include fibromyalgia and scarring. In addition to that, the product is also an excellent moisturizer and encourages the skin to become healthier. Cocoa butter eye creams have also been shown to increase the elasticity of the skin. You will end up with smooth, supple skin which will also ensure that wrinkles and lines will not be visible. The compound polyphenol contained in the cocoa butter is responsible for this effect. Anti-inflammatory agents within the cocoa butter also reduces dark circles. As you can see, cocoa butter can be effective in removing dark circles from your eyes, making you look more presentable. For best results, you should combine it with other efforts, including making sure that you have enough sleep and also find the root cause of the dark eyes and treat it. Yes. Apart from preventing dry skin, cocoa butter has been used as nourishing skin care ingredients for various self tanners, sun tanning oils, and summer lotions. Their unique properties make them great emollients for high heat situations during the summer. There are many reasons why this is so. For one, cocoa butter has excellent moisturizing benefits. The oils within the butter lock in water close to the skin, keeping it hydrated all day long. Applying the cocoa butter to your body before tanning will ensure that your skin doesn’t dry off, which can do more harm than good. The cocoa butter can be used whether you intend to get the tan in a self-tanner or by basking in the sun during summer. The other reason why cocoa butter is excellent for tanning is the fact that it prevents flaking of the skin. This is a major problem for people who spend too much time in the sun. Without any protection from evaporation and heat, the skin becomes so dry that it starts peeling off. This look is usually unsightly, and the use of cocoa butter to ameliorate it has been shown to be effective. To keep you safe when tanning, you can use cocoa butter either on its own or when combined with a tanning lotion. If you prefer the latter, you should specifically look for a tanning lotion that has cocoa butter as a major ingredient. These two natural ingredients are not the same because they come from different sources. Shea butter is extracted from the nuts of the Shea tree while cocoa butter is extracted from cocoa beans. They seem similar because many companies in the beauty industry use them to make cosmetics, creams, soaps, and lotions. The first of these is the extraction method. The products used to make cocoa butter and Shea butter are extracted from two different trees. Cocoa butter is synthesized from the cacao tree, normally found in Mexico and West Africa. Shea butter, on the other hand, is made from the Shea tree which is indigenous to Africa mostly in the west, central and east Africa. The two products also differ slightly in their chemical compositions. Cocoa butter has a high concentration of oleic acid, stearic acid and palmitic acid. On the other hand, while Shea butter also has high concentrations of oleic and stearic acids, the palmitic acid is in trace amounts only. In addition to that, Shea butter has other chemicals not found in cocoa butter including linoleic acid and arachidic acid. The quantities of all these chemicals differ between the two products. Also, shea butter is less hard compared to cocoa butter, and can melt when it comes into contact with the human skin. It has a vanilla aroma, while cocoa butter has a chocolate aroma. Mango butter comes from the seeds of the mango tree. Although the trees are native to South Asia. they are now grown in tropical locations around the globe. Apart from the delicious mango flesh, the seeds of the fruit have been recognized for their health benefits. The extraction process is fairly simple. Fat is first extracted from dried mango kennels. This is done by solvent extraction or by hydraulic pressure. The latter option is ideal since it does not involve additives. It is also faster. Hexane is used in solvent extraction. Mango seeds are collected, dried and washed. The seeds are then dried again to get rid of moisture content. The seeds are then roasted in drum roller coasters before their hulls are removed manually or mechanically. It is at this point that kennels are separated and crushed into small pieces. The small pieces are ferried by a conveyor to pellet making machines. Pellets are then made and cooled in a cooler. The pellets then get conveyed to a solvent extraction plant where mango butter is made. The extraction process may sound complicated. It is however very simple. There are in fact, people who make their own mango butter at home. Either way, you can still enjoy all the afore-hinted benefits of mango butter. Consider using mango butter if you have fuzzy hair. Consider it too if you have psoriasis or eczema. Then pack it alongside other beauty products for your summer vacation. It will keep your skin moisturized and protect it from ultraviolet rays of the sun. Kokum is an indigenous tree (Garcinia Indica) that grows in the tropical rain forests of South India’s Western Ghats. With that, kokum butter comes from the fruit kernels of the Indian tree. This evergreen tree can also be found in several locations, including West Bengal, Jaintia Hills, North Malabar, Konkan, and more. Garcinia Indica or Kokam as it is popularly known in India does not just produce Kokum butter. It’s leaves and the bark have also been proved to be medicinal. Once refined, Kokum butter turns smooth and white. The end product which is kokum butter has emollient properties and a mild odor. It is important to note that Kokum butter has a significantly higher melting point. It can melt slightly as skin temperature. This is a good property which makes it a good natural solution for making lipsticks and lip balms. Its earthy smell means that it does not make you uncomfortable. The smell can however be interfered with impurities like water. Storage too is yet another factor that can determine how effective your kokum butter will turn out. So store it well, in a dry place away from heat and direct sunlight. Kokum butter is non-greasy and resistant to oxidation. It, therefore, gets absorbed into the skin as soon as it is applied. Its antioxidant properties and vitamin E nutrients make it a perfect natural remedy for several skin conditions. It should however be noted that cocoa butter’s health benefits go beyond the skin. Its triglyceride composition for instance makes it handy for treating cracked heels. Cocoa butter is a type of pure, stable fat that’s pressed out of raw cocoa beans. Despite its name, cocoa butter does not contain any dairy products. This type of butter is ideal for beauty care products as it has the ability to retain its solid state at room temperature. It also contains antioxidants that help prevent rancidity. To understand why cocoa butter is used in the beauty industry, you have to go deeper into its composition. It contains high amounts of saturated fats which are derived from palmitic and stearic acids. That is not everything though. Cocoa butter also contains flavonoid and polyphenol antioxidants. It is, therefore, one of the best natural remedies for wrinkles, blemishes, scars and acne. 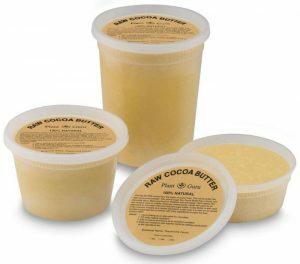 Note that there is a difference between raw cocoa butter and heated cocoa butter. Raw butter, which is sometimes referred to as pure cocoa butter is usually not heated to high temperatures during the manufacturing process. In other words, it is not highly processed, which makes it ideal and healthier compared to heated cocoa butter. 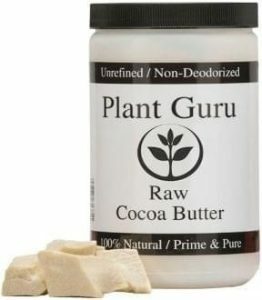 Raw cocoa butter also has a higher healthy fat content. There are of course, other health benefits that come along with cocoa butter. It soothes burns, treats mouth sores and treats infections. Men can also benefit from cocoa butter just as women. It makes a good shaving cream as it hydrates the skin and prevents irritation after a shave. Most of our butter products are harmless in their natural form. In fact, some of them are edible. However, different people react differently to each butter product. If you experience hives or an itchy rash, you should contact your doctor without delay. Another thing you need to know is the fact that there are essential oils meant for ingesting. They cannot be effective if used in any other way. There is a cause of concern here though which has everything to do with overdosing. Fortunately, you can avoid this by reading the instruction manual that came with your butter product or essential oil. Remember that even for essential oils that can be ingested, you will still have to refrain for a while if you are pregnant. You can of course ingest an essential oil with the go ahead of your doctor or physician if you are pregnant. Be sure to also administer any essential oil to children with the go ahead of a pediatrician. The bottom line here is to always use butter products and its essential oils as per the recommended directions. You should also be quick to seek prompt medical assistance anytime you suspect you have overdosed or you have reason to believe your body is reacting badly to the butter product you ingested. Kokum butter has a fairly mild, nutty and earthy smell. Compared to cocoa butter and other vegetable butters, it possesses less natural odor. When you buy a new kokum butter, be sure to take it out of the box to air it and release any unpleasant odors. Once it is left in the open for a few hours, its distinct earthy fragrance will become more prominent. How you store your kokum butter is one of the main factors that will determine its smell. Store it well and it will retain its above mentioned natural smell. Once you buy any packaged kokum butter product, remove it from the box so as to release unpleasant odors. Then keep it open for at least two hours this will make sure that its earthy fragrance stays intact for long. 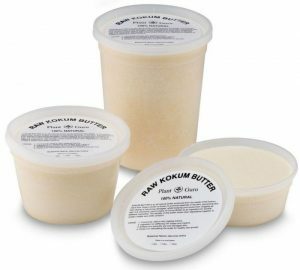 Note that raw kokum butter smells differently from refined and processed kokum butter. Raw kokum butter has a smell that is similar to the smell of sun-dried kokum which is usually used for culinary purposes. Impurities can also affect how kokum butter smells. That is why experts recommend using kokum butter on its own, in its pure form. It can easily lose both its smell and healing properties with slight impurities. So if you have to mix it with other essential oils, make sure that you do so under the directions of your kokum butter product manufacturer. That way, your kokum butter will retain its properties, remain fresh for a long time without going rancid and get rid of scars, blemishes and an uneven skin tone. Lastly, always store your kokum butter away from a direct sunlight. 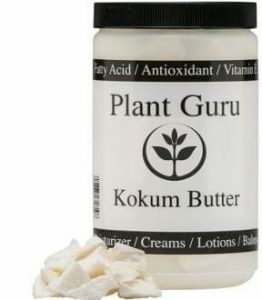 Found in a variety of balms, bar soaps, hair conditioners, and lotions, kokum butter is a very stable and hard vegetable butter. It can soften the skin, stabilize emulsions, restore skin flexibility, reduce skin cells degeneration, heal fissures of the lips, heal ulcers, prevent dry skin, and more. Unknown to many people kokum butter is used beyond the cosmetics industry. It is also used in making toiletries and confectionary. It is tender, has almost no smell and has a long shelf life. There is also the fact that it does not melt easily and has a high SPF content. You can therefore pack kokum butter for your summer vacation to keep you hydrated and protect your skin from harmful UV rays. All these factors and even more explain why kokum butter is widely used to make soaps, creams, lip balms and even body creams. There are other little-known nutrients found in Kokum butter which are ideal for your skin and overall health. It is rich in essential fatty acids, vitamin E and citric acids. You do not have to worry at all if you have sensitive skin as kokum butter is mild on nearly all skin types. You should however consult your physician first if you are under prescription to treat and underlying skin condition. Lastly, kokum butter can also be used to treat and manage your hair. It can come to your rescue if you have frizzy hair. Use it regularly and your hair will straighten, become strong and manageable within a short time. Mango butter is one of the most caring and healthiest solutions for the skin. It can be used to nourish the skin, hydrate it, treat skin rashes, treat insect bites, heal skin affected by frostbite or sunburn, smoothen out wrinkles, smooth acne scarring, and more. Your skin needs to stay moisturized and hydrated for long. Mango butter steps in as a good solution to keep your skin moisturized. It prevents skin chapping and dryness. To that extent, it works well even for people with sensitive skin. Be sure to also use mango butter if you have cracked heels. Lastly, pack mango butter with you before going for summer vacation. You will need it to protect your skin from the sun as already explained. You will also need to use it as a lip balm to prevent your lips from chapping. Other skin conditions that can be cured by mango butter include eczema, poison ivy and skin rash. Mango butter is one of the healthiest and most caring solutions for your skin. It works on both sensitive and less sensitive skin types. It can be used to heal, regenerate and soften skin tissues. All these perks boil down to the many healthy and nutritious ingredients that naturally occur in mango butter. 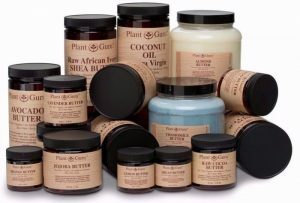 Cocoa butter is extracted from cocoa beans, mango butter is extracted from the seeds of a mango tree, Shea butter is pressed from the seeds of a Shea tree, and kokum butter is derived from the Garcinia tree. These types of butter vary in color, consistency, and texture as well. Cocoa butter is derived from cocoa beans. It has high fat content which is good for your skin and hair. It is ideal for treating eczema and getting rid of stretch marks. It is also used sometimes to treat uneven skin tones and blemishes. Mango butter, as the name suggests, is derived from the mango fruit. It is rich in vitamins A, C and E which happen to be the three main important vitamins used to fight free radicals. This means that you can use mango butter to treat sunburns and to smoothen your skin. Kokum butter is used to regenerate skin cells. Like shea butter, it is one of the most effective body butters as far as anti-aging is concerned. Kokum butter’s triglyceride composition also means that it is one of the best alternatives to shea butter. It promotes skin elasticity, prevents skin dryness and restores damaged skin. Unknown to many, kokum butter is one of the hardest and most stable vegetable oils on earth. Then there is Shea butter is rich in vitamins A, E and F. Of these three vitamins, Vitamin A is the dominant one. That means shea butter is good for your skin and hair. It has been used for years to treat splitting hair, itchy scalps and even frostbites. No, cocoa butter does not contain caffeine. Do keep in mind that the naturally-occurring caffeine within the cacao plant is concentrated in the nibs of the bean. When cocoa butter is pressed out or extracted from the chocolate liquor, the caffeine and cocoa solids are left behind. In other words, cocoa butter is the pure fat of the bean. Like already mentioned, cocoa has naturally occurring caffeine found in the cacao plant. The caffeine is concentrated in average amounts in the nibs of cocoa beans. As the cocoa butter is pressed from beans, chocolate liquor is left. Cocoa solids and caffeine are then left. The end product of this process is cocoa butter which is caffeine free. Note too that white chocolate is caffeine free because it contains cocoa solids. With that in mind, feel free to use your cocoa butter without worrying whether or not it has caffeine content. This is not to say though that caffeine is bad for your health. There are of course, cocoa products that contain caffeine. Your best bet therefore is to always read instruction manual or the packaging of your cocoa butter product so as to better understand its contents. Be sure to also check on other things like expiration date and purity of the cocoa butter you intend to buy. If you are looking for caffeine-free butter products, cocoa butter is definitely a good choice. Shea butter is rich in vitamins A, E, K and F, and is generally good for skin lightening. If you have got acne, you can use Shea butter to reduce redness and inflammation. This helps even out skin color/tone and lighten the face. Skin pigmentation is also another problem that shea butter can easily get rid of. That is, if the skin around your eyes, mouth or nose is darker than the rest of your body, shea butter can even out the pigmentation. This may take time though, so you may have to be patient. Remember that your skin type also plays a vital role when it comes to how effective you shea butter can be on your skin. Sensitive skin types will for instance, take a long time to respond to shea butter. Not so with normal, moisturized skin types. With that in mind, understand your skin type before using any shea butter product to lighten your skin. Then like already hinted, shea butter cannot darken your skin. It can also be used for tanning alongside other skin products. If you have acne breakouts and oily skin, then shea butter is certainly a good option for you. It can help you clear scars and blemishes caused by such conditions. Shea butter has an extensive list of benefits for hair, including promoting hair growth. This type of butter can keep your scalp nourished and moisturized with vitamins and fats, which helps prevent hair loss. In addition, sleeping or weak hair follicles can be rejuvenated and strengthened with the help of Shea butter. The main nutrients found in shea butter are vitamins A, F and E. The nutrients are rich in both antioxidant and anti-inflammatory properties which can strengthen your scalp. This is important for your hair as an unhealthy scalp means weak hair that is susceptible to split ends and falling. To avoid such conditions, shea butter steps in as a natural remedy. It will heal an inflamed scalp and allow hair to grow. Be sure to use unrefined shea butter as it has no added preservatives or chemicals. In short, whatever is good for your scalp is also good for your hair and of course, skin. Shea butter can also restore your damaged hair. Vitamins A and E found in it work by adding moisture to dull, dry, brittle and seemingly lifeless hair. The vitamins hydrate, soften and condition damaged hair. So if for any reason your hair has been damaged by harsh hair chemicals, blow dryers or straighteners, your best bet is to consider shea butter as a natural remedy. Remember that shea butter can only work when stored under the right conditions. It becomes ‘weak’ when it goes rancid. Simply store it in a cool, dry place, away from heat and direct sunlight. Shea butter is non-comedogenic and will not clog your pores. Instead, it contains moisturizers that mimic the moisturizers in sebum. As it tricks your skin into thinking it has sufficient sebum, overproduction of sebum is prevented. Shea butter is recommended for those with dry skin! The natural moisturizers in shea butter are in so many ways like the moisturizers in sebum. They ‘trick’ your skin to think that it has enough sebum. Your skin therefore stops overproducing sebum and remains moisturized for hours. This explains why shea butter is a natural remedy for dry skin. It also boasts of antimicrobial and anti-inflammatory properties that can easily treat acne lesions. Shea butter is also rich in vitamin A which can accelerate healing. It can get rid of blemishes, eczema, wrinkles, dermatitis and scars. 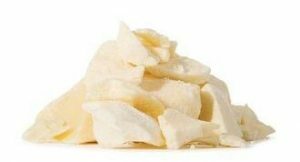 Apart from vitamin A, shea butter is also rich in vitamin E and polyphenols, which boast of anti-inflammatory properties. With all the properties mentioned above, you can apply shea butter on your skin without having to worry if it will clog your pores and cause more breakouts. Far from such misconceptions, you can apply shea butter on your skin to cure acne and get rid of scars. Be sure though to always use shea butter as directed by your dermatologist. Lastly, store your shea butter under the right conditions so as to derive maximum benefits from it. Store it in a cool, dry place away from direct sunlight and heat. Remember shea butter may become ineffective it goes rancid after poor storage. When you see the word “mango,” you automatically have the impression that mango butter smells or taste sweet. However, refined mango butter smells nothing like mangos. It is derived from the seed, not from the fruit pulp. In some cases, mango butter is known to emit a slightly sweet and fatty aroma in its natural form. Unlike what many people think, mango butter does not smell like the mango fruit. This is because of the way it is extracted from the kernel of the mango tree. There are of course, processed mango butter products with added preservatives and artificial fragrances. Compared to raw, unrefined mango butter, the processed one is less effective. It also has a shorter shelf life. Your best bet is to therefore stick to pure, minimally processed mango butter. Note that there are so many factors that can affect the natural smell of mango butter. Whether it has been processed or not is one of them as already explained. Impurities can also affect the smell of mango butter. You will notice this once your mango butter goes rancid just a few months after buying it. Storage is also a factor that can have an effect on how mango butter smells. Store it as it’s recommended and you certainly will not have a problem with its purity and fragrance. Store it under direct sunlight and before long, you will notice a different smell that may be unpleasant. So store your mango butter in a cool and dry place all the time. Then only use it in amounts that you need and keep its package tightly closed. Some mango butter products boast a natural SPF of 4-6. However, that amount is too minimal to protect your skin from the sun. If you require SPF protection, you should look at other oils such as wheat germ oil (SPF 20), carrot seed oil (SPF 38-40), or red raspberry seed oil (SPF 28-50). To understand more about mango butter’s natural SPF, you have to look at its composition and other properties separately. Only then can you appreciate its healing properties and use it appropriately. It is extracted from kernels of the tropical mango tree. Its sweet smell makes it ideal for use in soap making. It is also used to make lip balms, creams and body lotions. 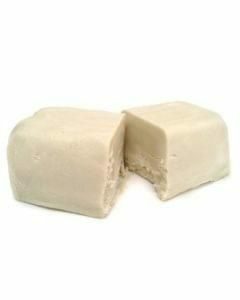 It shares almost the same properties with cocoa and shea butters. Mango butter is rich in vitamins A and E which are beneficial for your skin. It is also a natural antioxidant. A cup of pure mango butter can provide your skin with more than 70% of your daily vitamin C intake and more than 20% of your daily vitamin A intake. So every time you eat a mango or drink its juice, remember too to consider buying mango butter. Lastly, mango butter is naturally emollient. It can smoothen and soften your skin within days. This means that apart from benefiting from its natural SPF, you will also benefit a lot from its skin rejuvenating and replenishing properties. Be sure to also use it to shave as it does not clog skin pores. Mango butter is a non-comedogenic product, which means it will not clog pores and further aggravate acne-prone skin. It is a natural emollient with regenerative and wound healing properties. It can also help treat dry skin issues, clears blemishes, heal skin rashes, and more. Packed with vitamins A, C and E, mango butter is rich in stearic acid which plays a vital role when it comes to opening up skin pores. It is also a strong antiseptic that can easily attach to dirt and oil. This means that mango butter can easily get rid of free radicals once you apply it directly on your skin. Allow it to sit on your skin for at least 30 minutes. Then rinse it with clean water and allow your skin to breathe before you can use any skin care product on it. Men can also benefit from mango butter as much as women do. Since it does not clog pores, it stands out as a good shaving alternative. You can replace your regular shaving cream with mango butter and experience its amazing healing properties on your skin. Finally, you can use mango butter to treat skin conditions like psoriasis and eczema. You can also use it to strengthen your scalp and to straighten your hair. In a nutshell, there is much more into mango butter than just the fact that it will not clog your skin pores. Kokum butter does not have SPF. However, it can be combined with a sunscreen of SPF 20 or 25 to form useful items such as a homemade roll-on sunscreen stick. It is a brittle oil that can be very hard at room temperature and has the same firm-yet-spreadable consistency as cocoa butter. Another factor that compliments kokum butter’s SPF content has a lot to do with its triglyceride composition. This is advantageous in two ways. The properties will make your skin glow and remain healthy. But over and beyond that, you can be sure that you won’t have to sweat too much under the sun as your skin gets damaged by harsh Ultra Violet rays. Kokum butter is simply light with the ability to work as a side effect free base for retaining moisture. Your skin therefore remains hydrated and healthy for long during hot summer days or whenever you are anywhere where the sun shines for long hours. Lastly, keep in mind that kokum butter is not as greasy as cocoa butter. It is in fact one of the hardest butters. So read your product packaging instructions on how to best liquefy your cocoa butter before using it. Be extra cautious too if you have sensitive skin. Kokum butter is different from cocoa butter as it is non-comedogenic and well known for its regenerative and emollient properties. This means that it will not clog your pores. In fact, kokum butter is very useful for individuals who are prone to breakouts. Kokum is non-comedogenic, which simply means it does not clog pores. It is therefore ideal for treating several skin conditions. It can also be used to prepare the skin before you can treat it with other butters. Its properties can nourish your skin and protect it against dryness, premature wrinkling and other cruel signs of aging. For those with sensitive skin, kokum butter steps in a good natural remedy. It has the ability to rejuvenate damaged cells on your skin and restore its tenderness. There is also the fact that kokum butter has almost no scent at all. It therefore works well with several essential oils that have high SPF levels. With that in mind, pack your kokum butter product with you for summer holidays or for a tropical vacation where the sun may be harsh on your skin. It will protect you from free radicals that come from harmful ultraviolet rays. Lastly, kokum butter is also rich in anti-inflammatory, antioxidant and anti-bacterial properties which are all good for your skin. It gets better with the fact that you do not have to use kokum butter with any other product. Use it in its pure form consistently. Within a short time, you will notice its positive effects on your skin or even on your hair. Cocoa butter works effectively on all types of stretch marks. Whether you are treating stretch marks obtained during pregnancy or during a major weight loss program, you can use the cream to moisturize your skin and prevent more stretch marks from forming. The science behind how cocoa butter clears stretch marks is simple. It is rich in fatty acids that can keep your skin ultra-hydrated and well-nourished for a long time. Shea butter also contains vitamins A, F and E which play extremely vital roles when it comes to making your skin soft, tender and stretch mark free. Vitamins A and E can replace damaged collagen and elasticin fibers which are the two main causes of stretch marks. Both vitamins have also been proven by dermatologists to have anti-inflammatory properties that are good for your skin. Retinoids which are usually prescribed for several skin conditions is a special form of vitamin A. Your skin needs it for cell repair and growth. Retinoids can also prevent scaly and dry skin. Thankfully though, cocoa butter is rich in vitamin A as already explained. You therefore don’t have to worry about where you will get retinoids. Simply use cocoa butter as recommended by your healthcare provider or as directed on your shea butter product packaging. Lastly, stick to raw, unrefined shea butter. The more shea butter is subjected to processing the more it becomes ‘weak’. Remember to also store your shea butter well and avoid mixing it with other skin or hair care products. Mango butter is edible and can be used to make chocolate. This type of butter has a similar consistency to cocoa butter. However, mango butter may not live up to the deliciousness that its name suggests. That’s why it is mainly used to make cosmetics, such as a moisturizing body butter. Note that you can only consume mango butter in recommended amounts. Too much of it will certainly yield undesired results. Consume it as recommended and you can be sure of vitamins A, C and E. Vitamins A and C have been proven to have a direct impact on hair growth. Vitamin C, on the other hand, is good for your skin. You won’t have to struggle with mango butter at all if you plan to eat it. It has a pleasant smell that can easily boost your appetite. To make the most out of your mango butter, eat it as recommended and apply some on your skin. Do this on a regular basis so as to enjoy the benefits. Within a short time, it will rejuvenate your skin, keep it moisturized and protect it from harmful UV rays of the sun. Mango butter can also heal damaged, dry and chapped skin. The above-mentioned properties simply accelerate healing. 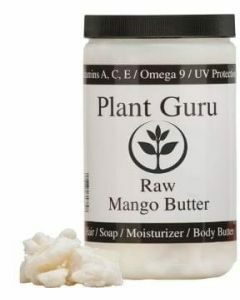 Eczema, frost bit and psoriasis are other skin conditions that can be easily treated using mango butter. The benefits as you will find out are endless. No, Kokum butter is not edible. It is mostly used for cosmetics, i.e. a substitute for cocoa butter. This type of butter is usually pressed from the seeds of Kokum – the dried skin of a fruit that’s related to mangosteens. Malic, citric and acetic acids are all found in the Kokum fruit. These are not the only ingredients though. The fruit is also rich in vitamin B complexes, garcinol and potassium. All these nutrients and more are good for your hair, skin and overall health. There are of course, several ways that you consume Kokum. You can eat it as a fruit or even in juice form. There is however one form of cocoa butter consumption that stands out especially in the beauty industry. That is kokum in butter form. It can be applied topically in this form or in any other way recommended by a physician. As an oil, it can be applied on heels to get rid of cracks. It can also be used as a lip balm to prevent chapped lips. Then there is the fact that kokum butter is one of the best natural moisturizers. It can keep your skin hydrated and moisturized for hours and even get rid of scars. To that extent, it is ideal for use during summer or when going out for a tropical vacation. Its SPF properties will go a long way to protect your skin from harmful UV rays that can easily damage your skin and cause premature aging. Yes, you can! People living in a Sub-Saharan climate have been using shea butter to protect their hair and skin for many years. If you are looking to relieve scalp problems such as dandruff, you can use this type of butter as a massage oil for the scalp. It’s effective and doesn’t leave behind a greasy mess. It is rich in vitamins A, F and E which can naturally protect your body from free radicals. This is advantageous in two ways. First off, free radicals can accelerate wrinkling so shea butter comes in to slow down the wrinkling process. It simply makes your skin glow and looks smoother and younger. For your hair, it prevents hair loss and hair splits as well as a myriad of other hair related complications. There is also the fact that shea butter can coat your hair shaft and protect it from damage caused by harsh hair products, straighteners and blow dryers. If you are a swimmer it can protect your hair from chlorine and salt found in swimming pools. You won’t have to worry about scalp related complications or having your hair split every time you come off the swimming pool.it gets even better with the fact that shea butter can accelerate healing when it comes to scalp inflammations. Lastly, shea butter can also be used as a natural hair protectant and sunscreen. In short, shea butter can protect your hair and skin from strong and potentially harmful ultraviolet rays from the sun. With that in mind, have your shea butter every summer. Shea butter product contains fatty acids that are very stable. This enables the products to have an exceptional shelf life and not go bad easily. The key to maintaining a longer shelf life also includes keeping stagnant water out of your Shea butter container. This way, you prevent mold from growing. When experts say that shea butter cannot go bad, they refer to raw and unrefined shea butter. That is because when shea butter is raw and unrefined, it contains stable essential fatty acids. The fatty acids can remain intact for long under the right conditions. 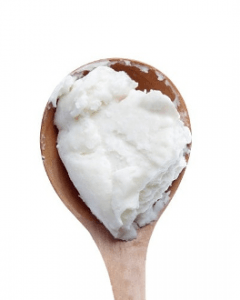 This increases shea butters shelf life and ensures it remains usable for years. There is also the fact that shea butter is rich in naturally occurring antioxidants. These antioxidants act as natural preservatives. They include vitamins C, E and A. So apart from supplementing your overall health, the nutrients and other properties in sheer butter also play a vital role in sustaining sheer butter itself. The bottom line here is, as long as your desired shea butter product is minimally processed, unrefined and well preserved it will not go bad. Its vitamins will also stay intact and prevent the shea butter from oxidation. Your best bet is to therefore read the directions for use on your sheer butter product and store it appropriately. Be sure to keep your shea butter product away from stagnant water. Water may not attract mold or even mildew on shea butter but it can make it impure and unfit for use. Be sure to also keep your shea butter product away from direct sunlight. Different types of Shea butter have different expiration dates. For example, refined Shea butter that has been processed are known to last very long without going bad. Next, unrefined Shea butter can last up to three years. 100% natural Shea butter has an average shelf life of 12-24 months. Always keep your raw, unrefined shea butter in a cool, dry place. Preferably below 55 degrees, F. Direct sunlight is also bad for your shea butter, so store it in a dark place away from direct sunlight or heat. You can of course heat shea butter to melt it before use. But when doing this, be keen not to overheat it. Scoop just a little to prevent it from melting repeatedly. Heat can easily make your shea butter go rancid. So avoid leaving your shea in the car with all the windows closed or in any other place with a lot of heat. Then contrary to what many people believe, mixing old shea butter with fresh shea butter is a bad idea. This will only spoil your sheer butter and shorten its lifespan. You can however use recommended natural preservatives like rosemary or vitamin E. The preservatives may increase shea butter’s shelf life but only for a few months. Then note that any impurity added to shea butter may make it ineffective. This means that you do not have to add anything to it at all. Just store it under the right conditions. The product can go bad if stored in poor conditions. You need to store your mango butter products in a dry and cool place, and away from direct sunlight. If your mango butter has a high percentage of FFA (free fatty acids), it may start to look and smell rancid. Impurities can easily shorten the shelf life of your mango butter. So store it in its pure form all the time. Water is a good example of an impurity that can shorten your mango butter’s shelf life. To prolong its lifespan, store it in a cool place. Your choice of storage should also be away from direct sunlight. Then remember that mango butter is hard. It will disperse easily on your skin once it comes in contact with it. Have it liquefied and warmed before using it. You may have to mix it with other cosmetic formulations mainly because mango butter does not fall under the category of oils that can be used alone. While doing this, scoop only the amount you can use for the day. That way, you can prevent waste. Lastly, be keen on the smell of your mango butter. It can become rancid easily when stored under undesirable conditions. You will then notice an unpleasant smell. Avoid using it as soon as you notice it has a strange place. It may be harmless even with its strange smell. For people with sensitive skin however, the results may be undesirable. To enjoy mango butter, store it well and use it as recommended. Mango butter is safe to use on one’s face. It can help clear up blemishes as it has antibacterial and anti-inflammatory properties. Before applying it on your face, you should wash your face with a mild cleanser first to remove dirt. After applying a thin coat of mango butter, avoid touching your face, especially when you are going to bed. To better understand how and why mango butter is ideal for your skin, you have to first look at the source of the butter. It is extracted from by a high tech process from the shelled fruit kennel of a mango tree. The butter is emollient a factor that makes it one of the most reliable and effective natural remedies for skin conditions. Mango butter has protective properties against ultraviolet rays. It can help your skin withstand radiation and in the process, prevent wrinkling and premature aging. You can also benefit from mango butter if you have frostbite. The butter simply expedites healing. Other benefits that come along with mango butter include healing properties that can cure eczema, poison ivy, sunburn and insect bites. In its pure form, mango butter does not have an unpleasant smell. It shares almost the same properties with shea butter as far as fragrance is concerned. That is in fact why it is ideal for making lip balms, lipsticks and other beauty products. It should however be noted that when it comes to mango butter, experts recommend that it should be used in its pure form. You should also exfoliate your skin well before using mango butter on it. Then avoid mango butter or use it with your physician’s recommendation if you have any serious underlying skin conditions. Definitely! Mango butter is effective for healing and improving your skin’s appearance. You can use it to soothe a sunburn, heal scars, reduce fine lines, treat psoriasis, prevent stretch marks, stop an itch from a bug bite, speed up the healing process of minor wounds, and more. Mango butter can protect your skin against harsh UV rays known for causing wrinkles, premature aging and other serious skin conditions. You only need to apply it evenly on your skin anytime you intend to stay out in the sun for long. Be sure to use it with a recommended solution. These protective properties mean that you should always have your mango butter with you during summer. You can also benefit from mango butter if you suffer from eczema, psoriasis or poison ivy. It will heal your skin within a short time and rejuvenate it. It simply works wonders on dead skin cells and replaces them in weeks. Feel free to also use mango butter to treat sunburns and frostbites. You will enjoy using to treat just about any skin condition as it has a pleasant smell. It also does not come along with any side effects. Lastly, you can use mango butter to keep your skin hydrated. It easily moisturizes your skin and allows it to breathe. In other words, it does not clog pores. As an added perk, you can use mango butter to treat cracked heels. Cocoa butter cannot diminish acne scars but can help restore softer and smoother skin, which previously had flaky and dry acne scars. You should look for 100% natural and pure formulas to achieve the best possible results. Cocoa butter can help keep your facial skin moist. Regular use of cocoa butter is highly recommended for people with sensitive skin. It can clear stubborn acne scars and stretch marks by moisturizing and realigning collagen fibers. There is a scientific explanation supporting how cocoa butter works. First off, it is an emollient. That means that it is rich in healthy ingredients like Vitamin E and omega 3 fatty acids. To get the most out of cocoa butter when treating acne, scrub it on a skin mildly with a soft wash cloth. This will exfoliate dead skin cells and allow cocoa butter to work on your pores. Then clean your skin with a mild, non-scented soap and rinse it well with running water. Use natural cocoa butter that is not highly refined. Commercial products often contain harsh chemicals in the name of preservatives which can do more harm than good on your skin. Once your face is clean, apply cocoa butter evenly. It will help your skin grow by retaining moisture. It will also allow your skin tissues to grow in a healthy environment by forming a protective barrier against harsh weather conditions that may not be good on your skin. Lastly, avoid mixing cocoa butter with other skin care products when treating acne related complications. Stick to pure cocoa butter. If and where possible, use only raw, unrefined cocoa butter. 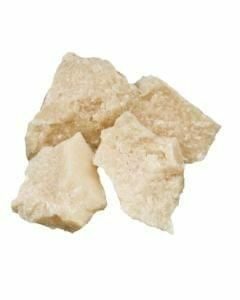 Cocoa butter does not fully clear acne scars. It makes them look less noticeable by smoothing out the texture and tone of the scars. As cocoa butter contains healthy fatty acids, you can apply this butter topically daily to help repair damaged skin. Fatty acids and vitamin E are the main ingredients that make cocoa butter an ideal remedy for different skin conditions. But it does not end at just the said ingredients. Cocoa butter has other emollient properties that can help you clear acne scars with ease. It can ‘set your skin free’ by exfoliating dead skin. This will allow your pores to breathe and help your skin grow. As this happens, stubborn acne scars will disappear. This may take time though. You therefore have to be patient and use cocoa butter regularly. Note that only 100% cocoa butter in the form of cocoa butter stick or cream works when it comes to clearing acne scars. This is the most concentrated option available. It yields maximum results compared to other cocoa butter products, mainly because it is not highly processed. Lastly, remember to exfoliate your skin before using cocoa butter on it. You can do this by applying cocoa butter stubborn dark spots. Let it sit for a few minutes then wash off with clean, running water. Avoid scrubbing hard and clean with a mild, unscented soap. Then wash off the cocoa butter gently in circles. Rinse well before applying pure cocoa butter on dark spots. You can, at this stage, layer it with your preferred cream or lotion. Yes, cocoa butter can be used as a moisturizer. The product helps users seal in moisture and keep their looking supple and healthy, especially when they are recovering from a scar. If you want your skin to retain its elasticity, using cocoa butter is a good idea. It is easy to understand why skin care experts refer to cocoa butter as a natural moisturizer. It is a strong emollient, rich in vitamin E and omega 3 fatty acids. Cocoa butter is therefore a potent antioxidant. The aforementioned ingredients in cocoa butter work by softening scar tissues on your skin and realigning collagen fibers. This not only moisturizes your skin but also promotes healing within a short time. Remember that for you to enjoy cocoa butter’s moisturizing properties, you have to use it regularly. Lastly, cocoa butter is a natural hydrant. It can help your skin to retain moisture for a long time and allow tissues to grow. It can also be beneficial for you if you work under harsh conditions like too much sun. Apply it on your skin evenly and it will form a protective layer that can withstand harsh weather conditions like harmful ultraviolet rays from the sun. Remember that cocoa butter works well on its own. So, avoid mixing it with other skin care products. Be sure to also use raw and unrefined cocoa butter.